Golden Horn Batholith - Tertiary period, Eocene epoch - (49 millions of years before present). The Golden Horn Batholith is a highly evolved alkaline (sodium-rich) granite that hosts a suite of rare minerals. About 50 million years ago, the magma that formed the batholith cooled and the rock-forming minerals began to crystallize. 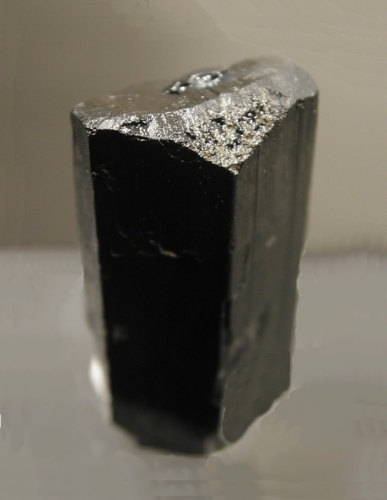 Through the process of fractional crystallization, the residual liquid became increasingly enriched in incompatible elements (such as lithium, zirconium, and the REE (rare earth elements)) as the rock-forming mineral phases that were crystallizing rejected them. Late stage volatile rich fluids carrying this highly fractionated chemistry precipitated a suite of rare minerals in miarolitic cavities within the alkaline granite. 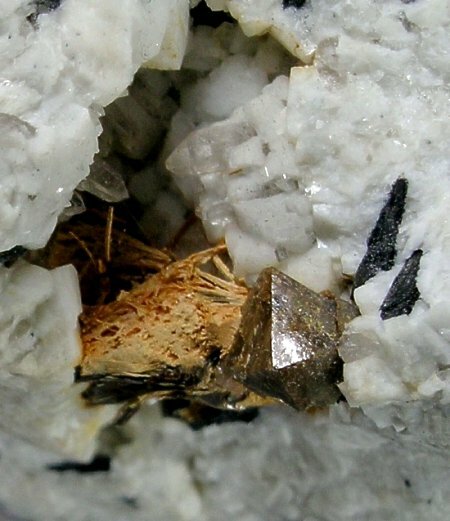 The Golden Horn Batholith is the type locality for three of these rare mineral species, zektzerite- NaLiZrSi6O15, the REE mineral, okanoganite- (Na,Ca)3(Y,Ce)12Si6B2O27F14 and calciohilairite- CaZr[SiO 3]3·3H2O. 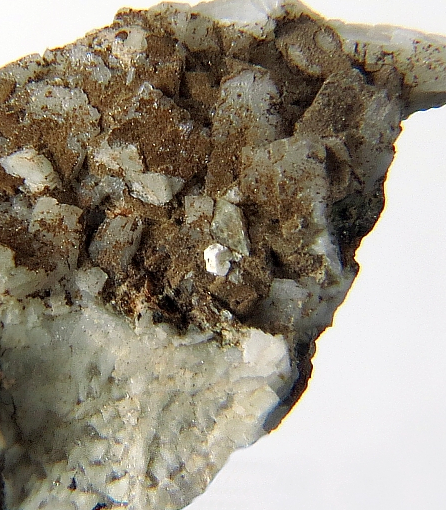 Over 50 mineral species have been identified at this locality, with a great potential for new mineral discoveries. 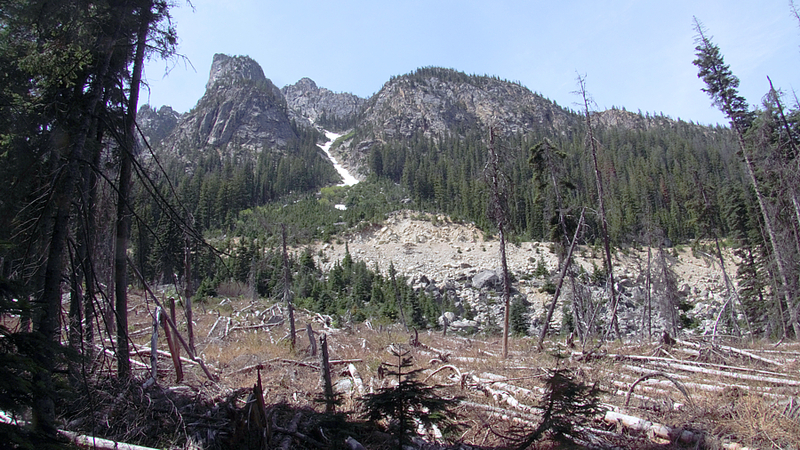 Collecting is within the Okanogan National Forest. 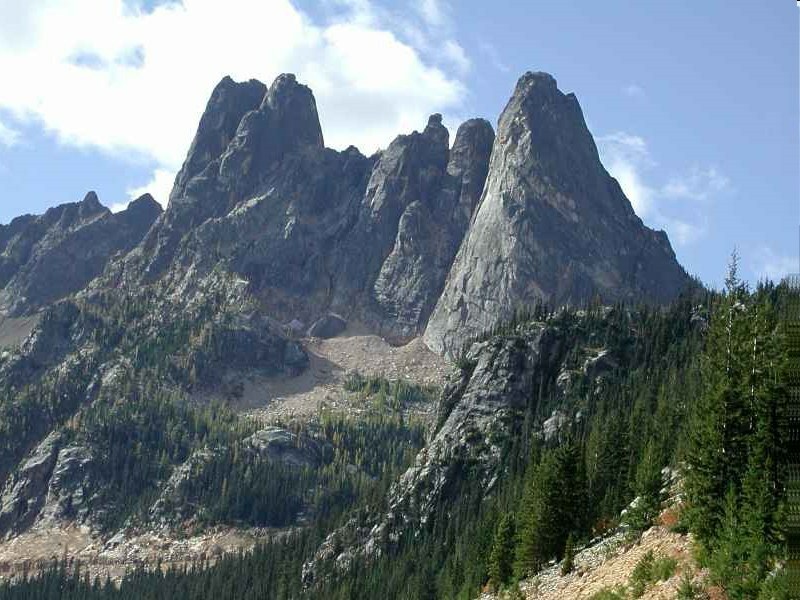 The host granite covers a vast area of of alpine terrain. 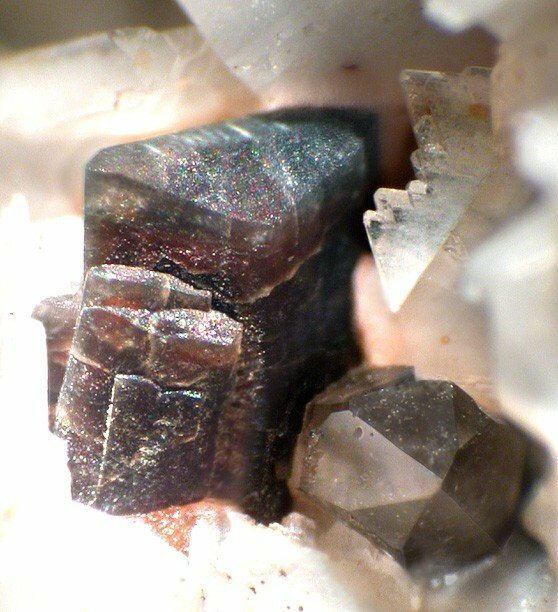 *Arfvedsonite- Na3(Fe,Mg)4(Fe,Al)Si8O22(OH)2 - Occurs as brilliant black prismatic crystals up to many centimeters in length in mariolitic cavities and and as acicular aggregates in pegmatitic portions of the alkali granite. 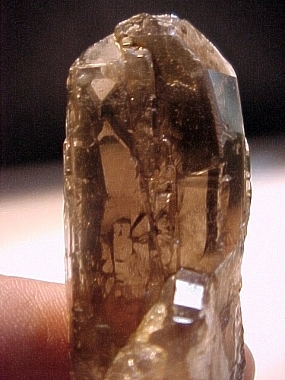 Also occurs as inclusions within smoky quartz. 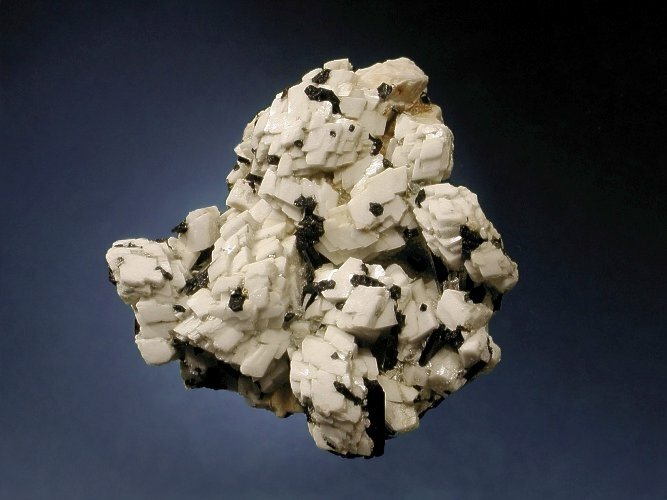 *Astrophyllite- (K,Na)3(Fe,Mn)7Ti2Si8O24(O,OH)7 - Occurs as bronze micaceous bladed aggregates with metallic luster in some miarolitic cavities and as massive aggregates in pegmatitic portions of the alkali granite. 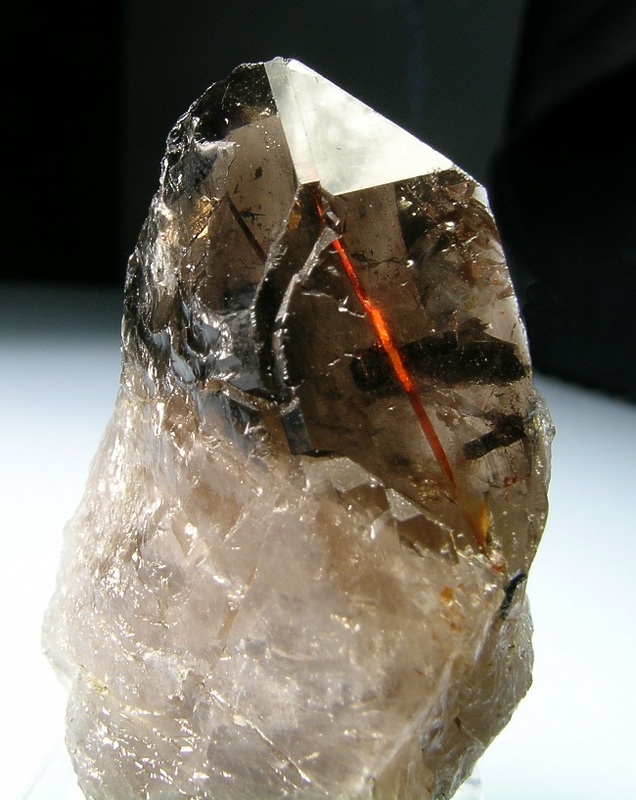 Some smoky quartz crystals contain brilliant thin transparent red blades of astrophyllite. 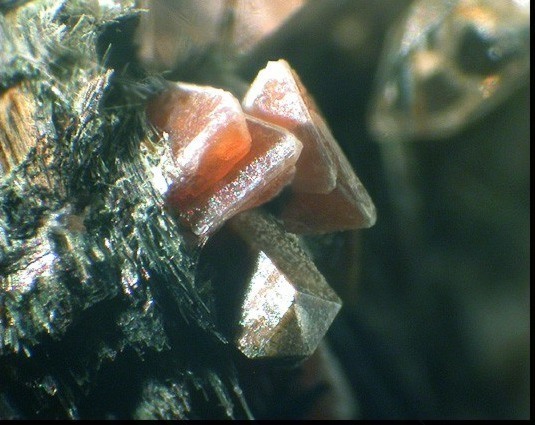 *Bastnaesite-(Ce) CeCO3(OH,F) - Occurs as mm-scale orange prismatic hexagonal crystals. 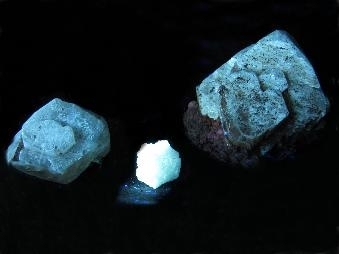 *Calciohilairite- CaZr[SiO 3]3·3H2O - Occurs as rare white to bluish-white microcrystals. 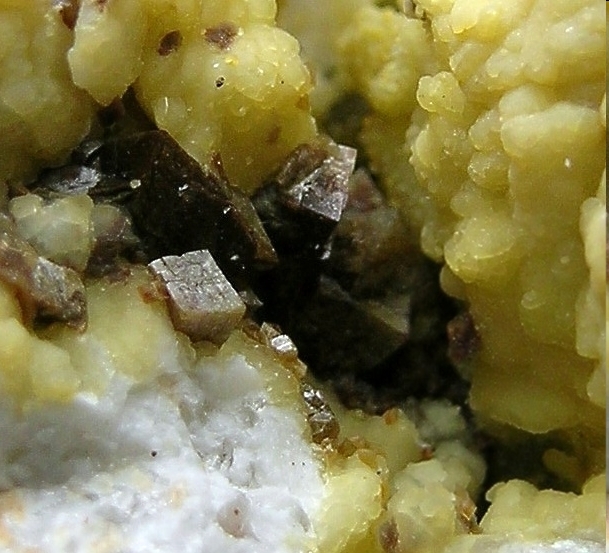 * Microcline- KAlSi3O8 - Occurs as opaque white crystals to 1 cm lining miarolitic cavities. 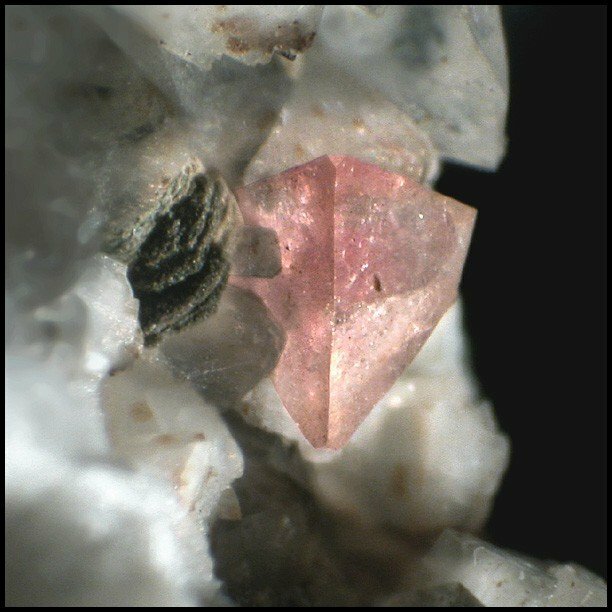 *Okanoganite- (Na,Ca)3(Y,Ce)12Si6B2O27F14 - Occurs as rare tan to peach colored crystals typically less than 1 mm. * Quartz- SiO2 - Occurs as milky to smoky crystals lining pockets up to a few decimeters in length. 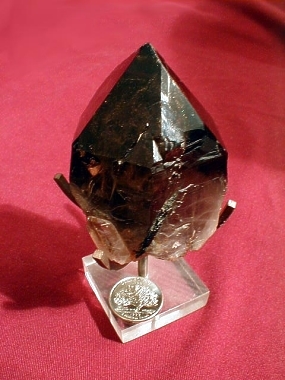 Some quartz is gemmy with a smoky-amethyst coloration. 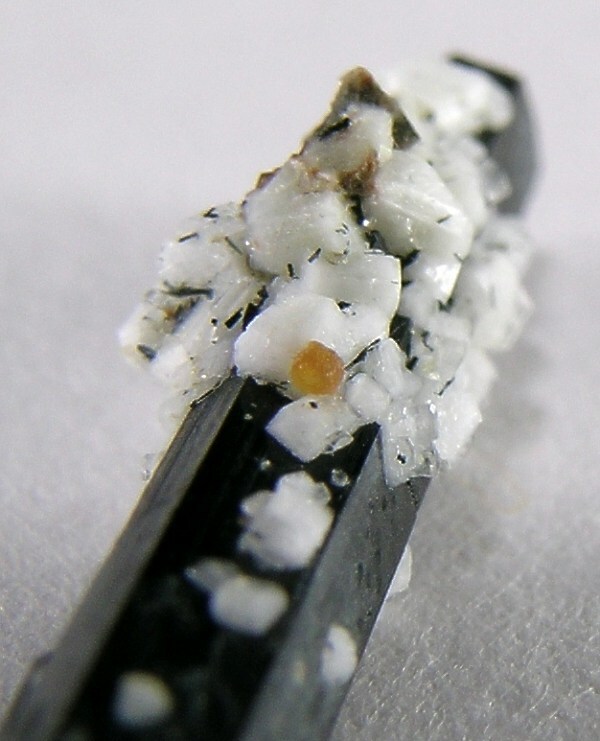 Inclusions of arfvedsonite, astrophyllite, or other species are common. 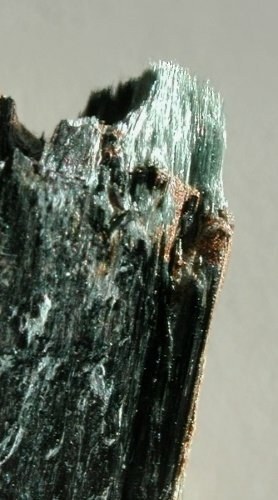 * Riebeckite- Na2Fe+32Fe+23(Si8O22)(OH)2 - Occurs as acicular opaque dark blue-green crystals. Some riebeckite is absestiform. 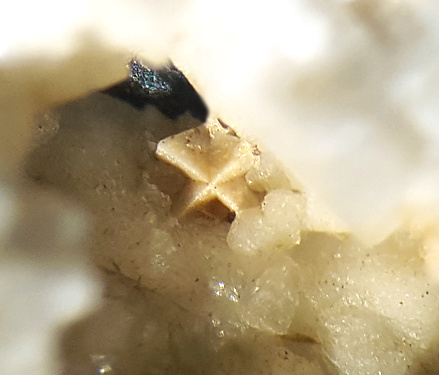 * Siderite- FeCO3 - Occurs as mm-scale rhombohedra in miarolitic cavities. 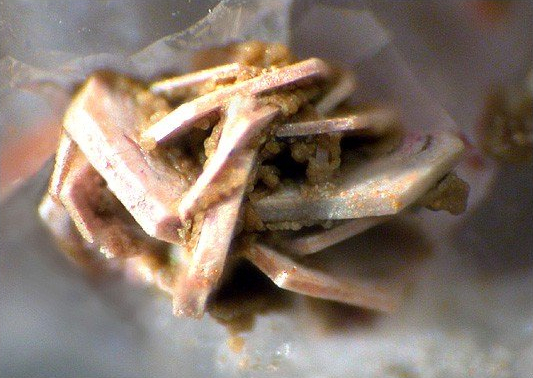 * Zektzerite- NaLiZrSi6O15 - Occurs as white to gemmy pink crystals to about 4 cm. 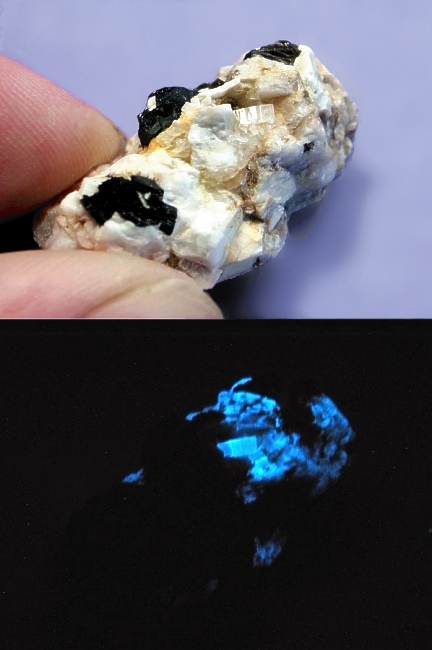 Zektzerite fluoresces green under short-wave ultraviolet light. 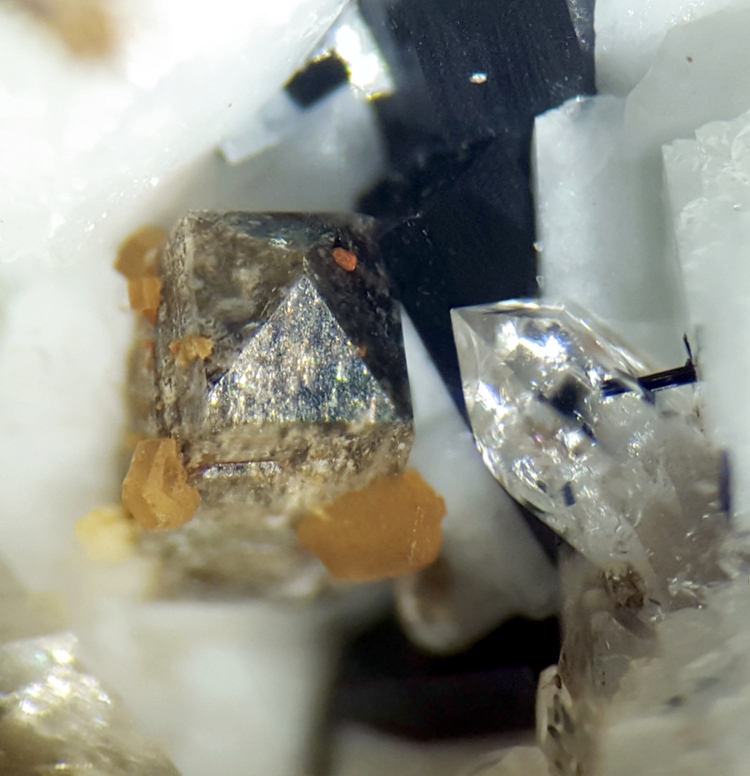 * Zircon- ZrSiO4 - Individual crystals to about 1 cm occur within some cavities. 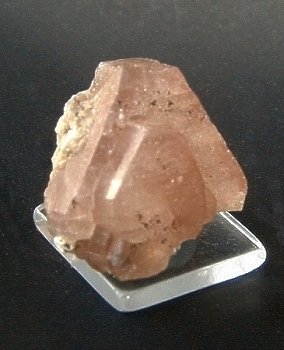 Specimens are brown, lusterous, and exhibit tetragonal prism faces. Becker, Randy, 1991, Minerals of the Golden Horn Batholith, Okanogan County, Washington, Rocks & Minerals, v. 66, no. 6, 450-459.